A generation ago, "cyberspace" was just a term from science fiction, used to describe the nascent network of computers linking a few university labs. Today, our entire modern way of life, from communication to commerce to conflict, fundamentally depends on the Internet. And the cybersecurity issues that result challenge literally everyone: politicians wrestling with everything from cybercrime to online freedom; generals protecting the nation from new forms of attack, while planning new cyberwars; business executives defending firms from once unimaginable threats, and looking to make money off of them; lawyers and ethicists building new frameworks for right and wrong. Most of all, cybersecurity issues affect us as individuals. We face new questions in everything from our rights and responsibilities as citizens of both the online and real world to simply how to protect ourselves and our families from a new type of danger. And yet, there is perhaps no issue that has grown so important, so quickly, and that touches so many, that remains so poorly understood. 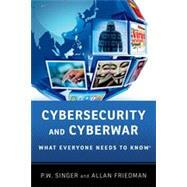 In Cybersecurity and CyberWar: What Everyone Needs to Know®, New York Times best-selling author P. W. Singer and noted cyber expert Allan Friedman team up to provide the kind of easy-to-read, yet deeply informative resource book that has been missing on this crucial issue of 21st century life. Written in a lively, accessible style, filled with engaging stories and illustrative anecdotes, the book is structured around the key question areas of cyberspace and its security: how it all works, why it all matters, and what can we do? Along the way, they take readers on a tour of the important (and entertaining) issues and characters of cybersecurity, from the "Anonymous" hacker group and the Stuxnet computer virus to the new cyber units of the Chinese and U.S. militaries. Cybersecurity and CyberWar: What Everyone Needs to Know® is the definitive account on the subject for us all, which comes not a moment too soon. Allan Friedman is a Fellow in Governance Studies and Research Director of the Center for Technology Innovation at the Brookings Institution. Why Write a Book about Cybersecurity and Cyberwar? Why Is There a Cybersecurity Knowledge Gap, and Why Does It Matter? How Did You Write the Book and What Do You Hope to Accomplish? On the Internet, How Do They Know Whether You Are a Dog? What Do We Mean by "Security" Anyway? One Phish, Two Phish, Red Phish, Cyber Phish: What Are Vulnerabilities? How Do We Trust in Cyberspace? Focus: What Happened in WikiLeaks? The Crimes of Tomorrow, Today: What Is Cybercrime? Shady RATs and Cyberspies: What Is Cyber Espionage? How Afraid Should We Be of Cyberterrorism? So How Do Terrorists Actually Use the Web? Focus: What Is Tor and Why Does Peeling Back the Onion Matter? Focus: What Is the US Military Approach to Cyberwar? Focus: What Is the Chinese Approach to Cyberwar? What about Deterrence in an Era of Cyberwar? Why Is Threat Assessment So Hard in Cyberspace? Does the Cybersecurity World Favor the Weak or the Strong? Who Has the Advantage, the Offense or the Defense? A New Kind of Arms Race: What Are the Dangers of Cyber Proliferation? Are There Lessons from Past Arms Races? Behind the Scenes: Is There a Cyber-Industrial Complex? PART III: WHAT CAN WE DO? Don't Get Fooled: Why Can't We Just Build a New, More Secure Internet? Rethink Security: What Is Resilience, and Why Is It Important? Reframe the Problem (and the Solution): What Can We Learn from Public Health? Learn from History: What Can (Real) Pirates Teach Us about Cybersecurity? Protect World Wide Governance for the World Wide Web: What Is the Role of International Institutions? "Graft" the Rule of Law: Do We Need a Cyberspace Treaty? Understand the Limits of the State in Cyberspace: Why Can't the Government Handle It? Rethink Government's Role: How Can We Better Organize for Cybersecurity? Approach It as a Public-Private Problem: How Do We Better Coordinate Defense? Exercise Is Good for You: How Can We Better Prepare for Cyber Incidents? Build Cybersecurity Incentives: Why Should I Do What You Want? Learn to Share: How Can We Better Collaborate on Information? Demand Disclosure: What Is the Role of Transparency? Get "Vigorous" about Responsibility: How Can We Create Accountability for Security? Find the IT Crowd: How Do We Solve the Cyber People Problem? Do Your Part: How Can I Protect Myself (and the Internet)? Where Is Cybersecurity Headed Next? What Do I Really Need to Know in the End?